University of Cambridge spin-out company, Paragraf, recently announced that it started producing graphene at up to eight inches (20cm) in diameter, large enough for commercial electronic devices. Paragraf is producing graphene ‘wafers’ and graphene-based electronic devices, which could be used in transistors, where graphene-based chips could deliver speeds more than ten times faster than silicon chips; and in chemical and electrical sensors, where graphene could increase sensitivity by a factor of more than 30. The company’s first device will reportedly be available in the next few months. 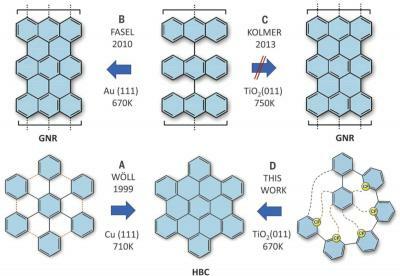 Researchers from Jagiellonian University in Poland, Oak Ridge National Laboratory in the U.S, Espeem S.A.R.L in Luxembourg and Friedrich Alexander University(FAU) in Germany have designed a method of forming nanographenes on metal oxide surfaces. 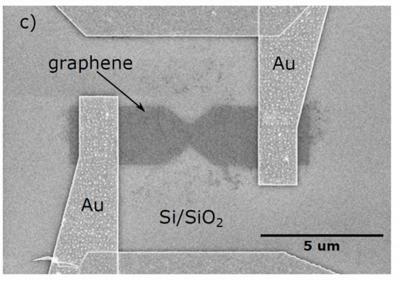 The team explains that in order to create an electronic circuit, the molecules of graphene must be synthesized and assembled directly on an insulating or semi-conductive surface. Although metal oxides are the best materials for this purpose, in contrast to metal surfaces, direct synthesis of nanographenes on metal oxide surfaces is not possible as they are considerably less chemically reactive. The researchers would have to carry out the process at high temperatures, which would lead to several uncontrollable secondary reactions. The team has now developed a method for synthesizing nanographenes on non-metallic surfaces, that is insulating surfaces or semi-conductors. The EU recently launched the Innovation Radar tool, an initiative to identify high potential innovations and innovators in EU-funded research and to increase their visibility through the Innovation Radar website, making them available to potential users and to the society. Graphene and 2D materials producer Grolltex has announced the completion of its recent capacity expansion and released production for 30,000 eight-inch wafer equivalents per year at its CVD monolayer fabrication facility in San Diego, California. “This is the only commercial CVD monolayer graphene production facility in California and in fact it is the largest capacity plant of its kind in the U.S.”, said CEO, Jeff Draa. “Demand for our electronics grade graphene has never been better. Our production lines are capable of producing single layer graphene or single layer hexagonal Boron Nitride”. Aiming to ramp up their international operations, Urbix Resources will reportedly work with Hanoi-based Vietnam Graphite Group to build a 70,000 tonne purification plant in Vietnam. The Vietnamese purification plant will be situated within VGG’s graphite mining operations in North Western Vietnam and will serve customers in Japan and the surrounding region. The facility is scheduled for stage one completion in late 2020. It is anticipated the purification plant will have the capability of achieving revenues exceeding US $200 million annually once the second stage is completed the following year. It appears that the plant will be used to produce, among other materials, graphene oxide and graphene nanoplatelets.